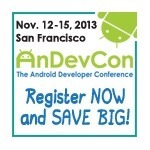 If you've been reading AP for any amount of time longer than, say, six months, then you've probably heard of AnDevCon, the biannual Android Developer Conference. We've been teaming up with the AnDevCon crew since the beginning, and have offered two developers a way into the conference – including all tutorials, workshops, and the like – with every passing event. This time's no different. Ticket pricing for the conference ranges anywhere from free (which basically gets you in the door and not much else), all the way up to $1795 if you wait until the last minute to order. Since it's before August 23rd, however, if you were to register right now, you could score your way in for $1,295. Fortunately, we love you and want to help you save those funds, so we have two of that exact package – which gets you the full ride – to give away. If you're not into the idea of waiting, however, you can also score $200 off the ticket price by using the code ANDROID at checkout. This giveaway is for the ticket only. It does not include airfare, hotel, food, or anything else you may need. Once the contest concludes on August, 14th at 11:59 PM PT, we'll hand-select the winners with the "best" answers. Good luck to all!